Tales say it was Adolf Hitler himself who ordered Ferdinand Porsche the Volkswagen Beetle under the idea that the car should drive through mud, sand, snow or ice without any trouble. But this story seems to forget another vehicle able to perform just as well under the most extreme conditions: A BMW motorbike powered by a boxer engine. To confirm this, you only have to look at World War II pictures and will rapidly see how these motorbikes were used by the german army on all fronts of the war: the european front, the russian campaign and the african battles fought in the dessert. Furthermore, classic BMW motorbikes are known for the reliability and sturdiness of its boxer engines, able to perform in any environment or situation in a way only external engines are able to demonstrate. For these reasons, we at Cafe Racer Dreams always try to work with BMW models that have this type of engines. And from all the posibilities, we especially like the BMW R100 series 7. A type of bike we feel really comfortable with that allows us to develop our creativity to its full potential. A mythical engine for a legendary motorbike: BMW’s boxer. 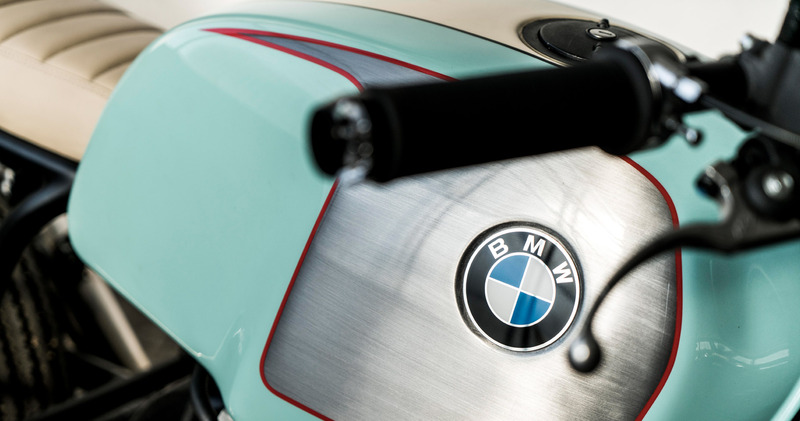 Starting in 1923, BMW uses the boxer engine as an identity sign for its motorbikes. For decades, they have trusted such technologies as the best option to consolidate the personality of their brand. This would have not been possible if these engines were not exceptional products that yield outstanding results. The CRD97 that we are presenting today -built in 6 weeks from a 1976 BMW R100 /7- has a dual cylinder boxer engine with 1,000 cc. This type of engine has paved its way into history books due to its toughness. Some stories even say that this engine is able of running without motor oil for hundreds of kilometres without any failures. Truth or not, it is best not to test such things, as it is recommended to take good care of these bikes so they can last as long as they have so far. Apart from this, nobody can deny that these engines have taken a place in the heart of motorbikes fans. 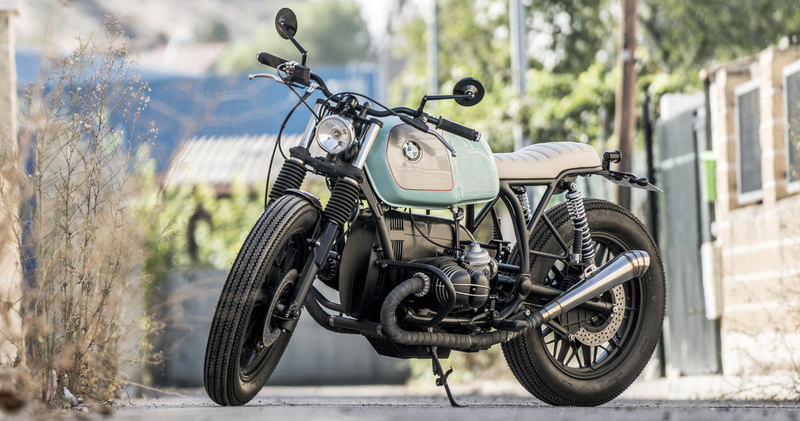 For this reason, our clients keep choosing the BMW R100 as the base model for their Cafe Racer Dreams. If you follow our creations, you probably already know that we at Cafe Racer Dreams try to maintain as many pieces as possible from the original bike so the restoration remains truthful. Nonetheless, we also believe that it is necessary to add our characteristic touches that identify all of our products. 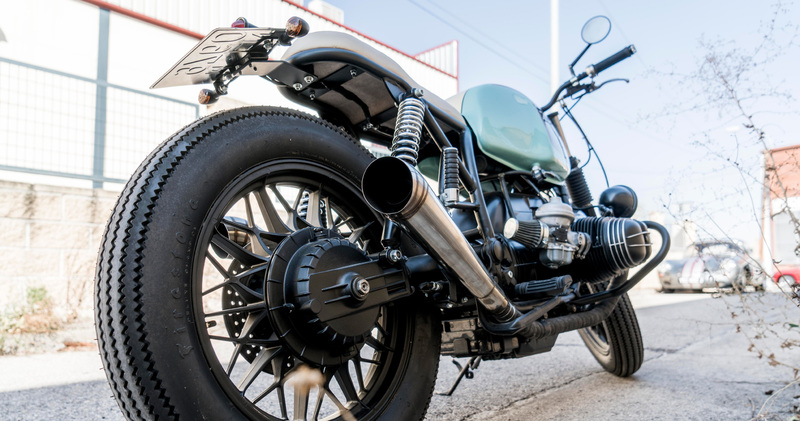 For this reason, and after a thorough reconditioning and restoration process, we have kept original pieces from the BMW R100 such as the engine, the chassis, the fork, the front rim, the brakes or the gas tank. Regarding this last component, it is worth noting that we carried a risky move which was later on backed by the client: we decided to paint the gas tank using a light blue tone, leaving the BMW logo area in a burnished silver. This gives the motorbike a vibrant and unique personality. CRD motorbikes are best known for a series of self-manufactured elements that, combined with the ones provided by our suppliers, make each of our bikes unique creations. Exhaust: together with the gas tank, the exhaust is one of the most iconic pieces of our garage. Subchassis: U-shaped, it is yet another typical element of Cafe Racer motorbikes. We carry out its manufacturing using artisan techniques. Headlight: another vintage symbol of the CRD brand. Mudguard: manufactured in our workshop at Paracuellos del Jarama. Number plate holder: complies with the current spanish homologation regulations. Rear light: just like the rest of the parts, it is self-manufactured. Seat: produced in high quality white leather, which offers a great contrast when paired with the light blue fuel tank. Suspension: manufactued by Hagon, it gives the motorbike a sporty touch. Handlebar: built by Rental Ultra Low, it comes in black anodized aluminum. Grips: these pieces have been acquired from Bitwell, in black rubber, that matches the handlebar and offers excelent grip in all situations. 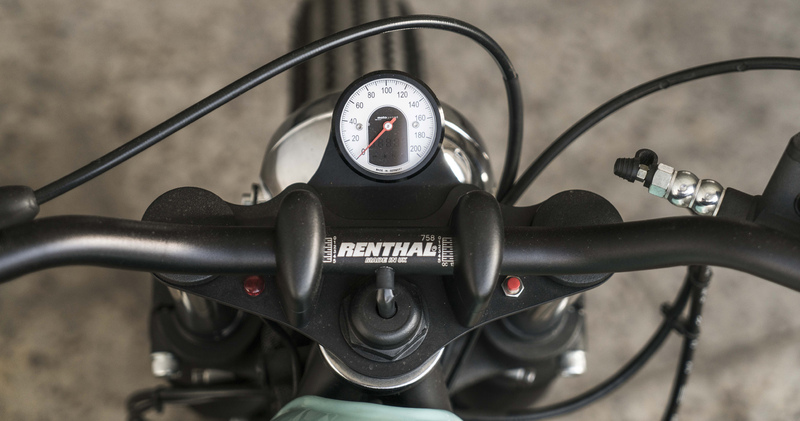 Speedometer: we have chosen a black polished aluminum option from Motogadget Tiny, well-known for its great precision. Tyre: for this part we always trust Firestone Deluxe, not only known for its quality but also the elegant and retro style that all of our motorbikes must have. ¿Considering purchasing a Cafe Racer Dreams motorbike? Please click here if you would like to see more pictures of this bike in action. Follow this link if you would like to keep looking at other BMWs created by Cafe Racer Dreams. If you can’t resist and are looking to buy one of our bikes, you can contact us here and become part of our waiting list. Beware that our production capacity is limited and demand is always higher than the supply available. If you are interested, send us a message so we can start working on your CRD as soon as possible.